If you are an organizational leader or conference planner interested in engaging your community in topics relevant to women, look here to see the various offerings I bring as a workshop facilitator, conference presenter and speaker. I design customized learning experiences and presentations that are engaging, inspiring and actionable. Customized workshops, presentations and facilitated discussions designed to create more awareness, deepen appreciation and invite women of all sectors to more fully leverage their innate skills and instincts as women leaders. These sessions incorporate the latest research , statistics and resources that underscore the competitive advantage that women bring to the workplace as leaders. Interactive learning experiences for the novice as well as the seasoned facilitator of groups, meetings and larger systems. The focus of these sessions is on understanding personal impact, appreciating the development and dynamics, and more effectively “reading” and intervening with a group to better serve its outcomes. 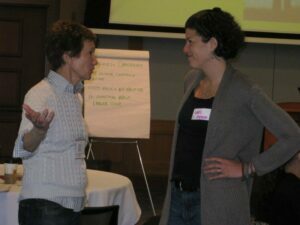 Group dialogues and learning forums designed to explore the unique perspectives we bring as women. Looking through the lens of the archetypal feminine to offer context and insight our values and principles, women examine their relationship to power, voice, personal sustainability, and how women can use our networks and innate abilities to support each other more effectively in the workplace and in life. Workshops and group discussions specifically designed with the busy working woman in mind. Topics range from navigating maternity leaves, opting-out of the workplace, and creating time for ourselves in the context of all our other roles.